I got a train for the short trip from Bharatpur to Delhi no problem at all. 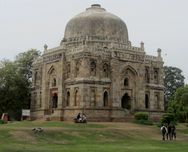 In contrast to Agra, the Delhi air was fresh and the city looked quite green - New Delhi anyway, as I had arrived in the south and was tuk-tukking north to my hotel in Pahanganj, near the main railway station and between New and old Delhi. 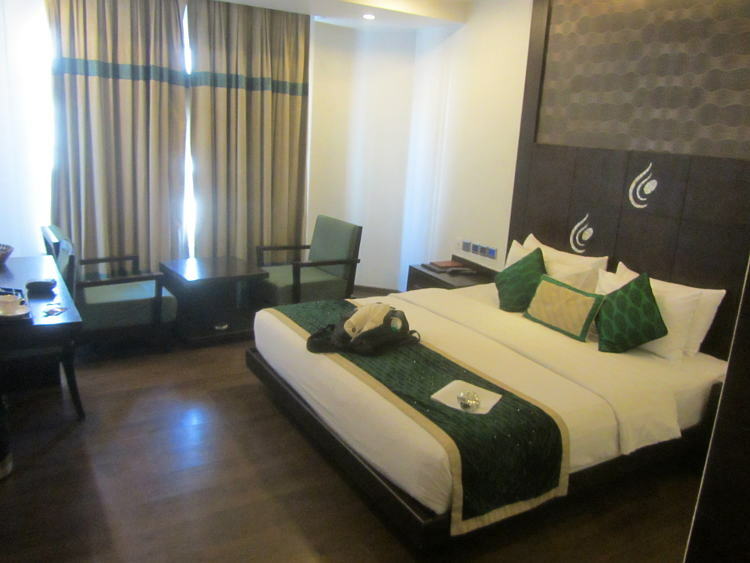 This is the main backbacker centre and packed with hotels with a price to suit everyone. 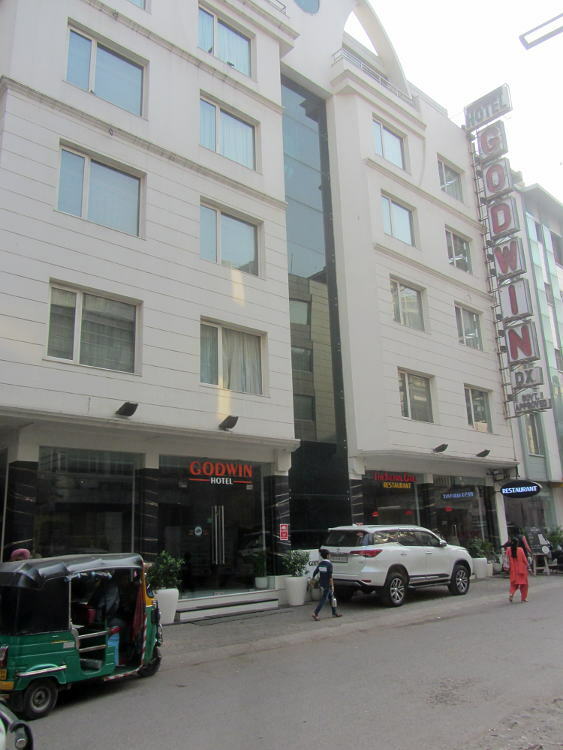 I usually choose a fairly decent hotel if I'm in a big city and the Hotel Godwin Deluxe was pretty good. Good enough for me to be really decadent and have a blueberry muffin and coffee on arrival. It's never straight forward however, as the wifi only worked in the stairwell which was a bit of a pain but there you go. What do you expect for £25 a night? Actually more than you get in India but that's another story. 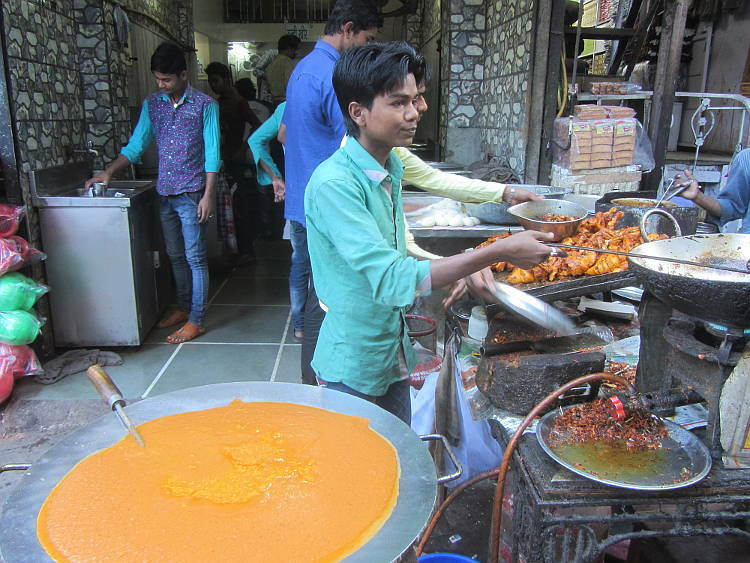 As I had been full on culture vulturing for the last month (Although I really enjoy them, I had seen enough Mogul monuments to last me a lifetime) I decided to just go for a walk to Connaught Circus, the heart of modern Delhi where all the swish shops and restaurants are. As it happened I had chosen a Sunday and most things were shut! The markets are always open, however, and I even remember the underground one from my trip here in 1994. They mainly sell clothes, so I had a mooch around and picked up a few T-shirts. I then popped into the craft museum which was quite interesting and good because it was free entry (I was also bit cheesed off with shelling out increasing amounts to see India's many monuments). 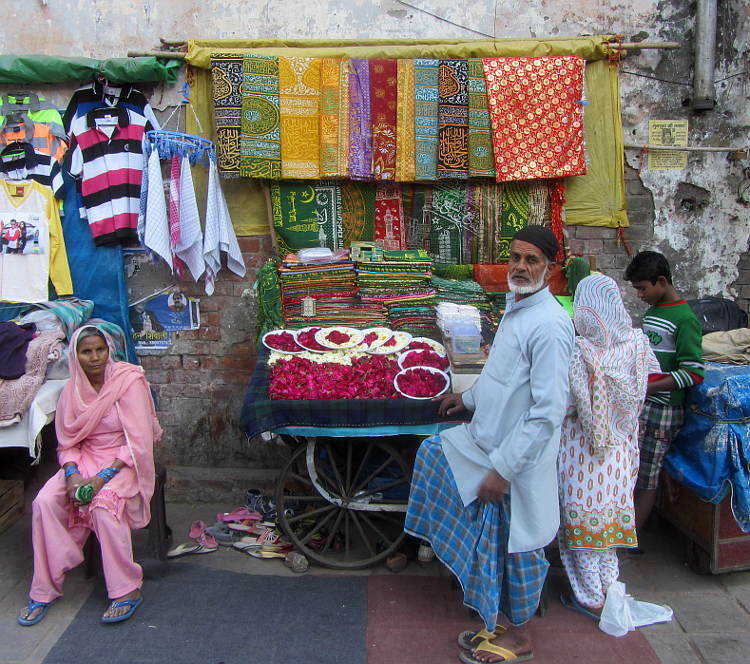 Plenty of interesting textiles from around India. It was just a shame that most of them seemed to have deteriorated in their glass cases over the years. Of course, I couldn't resist a bit more shopping now I was on the last leg of my journey so I bought some embroidered cushion covers. You can't have too many cushion covers can you? 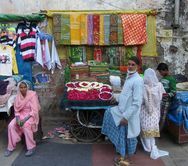 Of course I also went exploring the mass of narrow lanes in old Delhi. 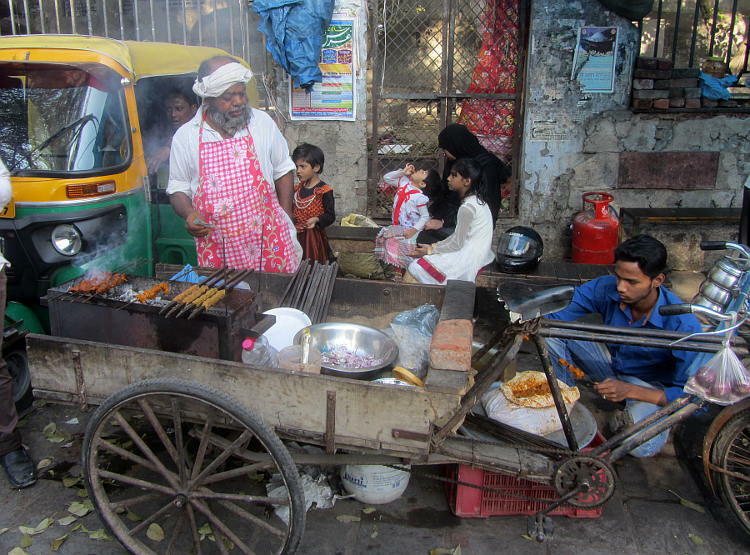 I took plenty of autorickshaws in Delhi and I thought they were fine and the traffic not too bad. But for a lot of trips I took the Metro which was very efficient. 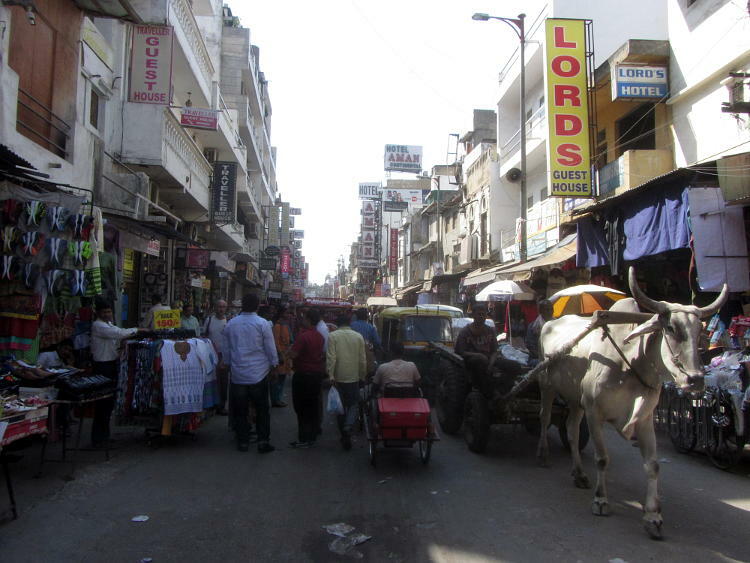 For this short trip I went from New Delhi Central Metro to Chandni Chowk. On the way to the station I saw a Red Kite close at hand. 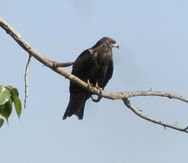 There is obviously plenty of wildlife right in the heart of the city. 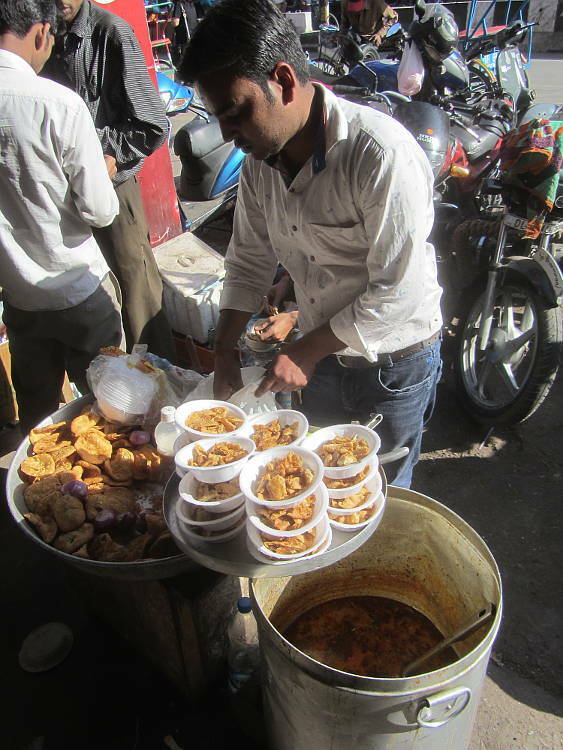 Anyway, the area around Chandni Chowk was interesting. 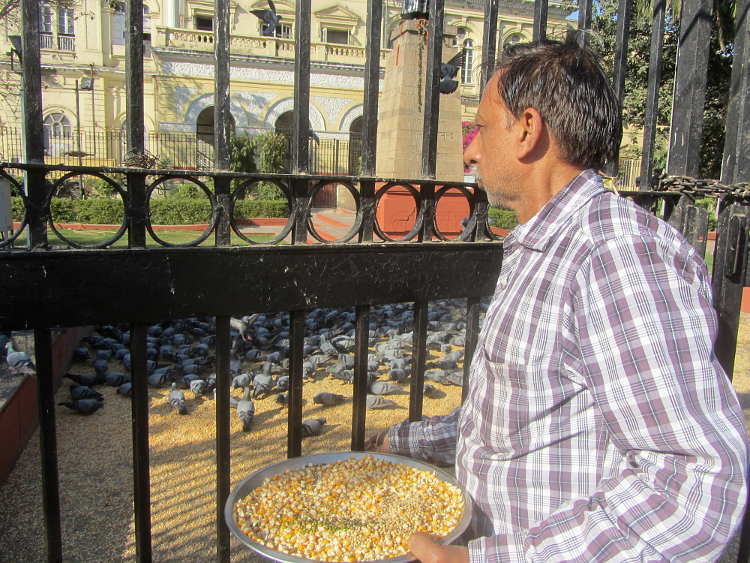 I saw one old building in large grounds all locked up but people were paying for corn and feeding the huge numbers of pigeons there. Remember Trafalgar Square in the old days? 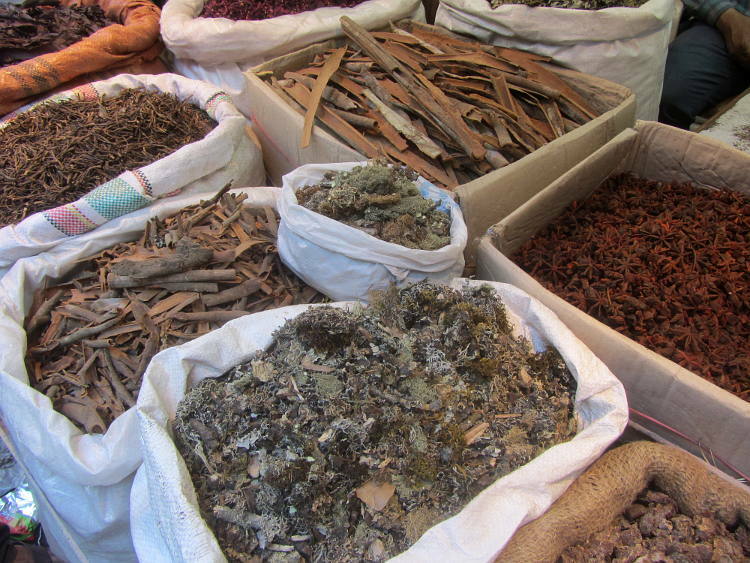 I also found the spice market which was interesting. Huge piles of spices and most people having to wear handkerchiefs over their faces because the aroma was so pungent. 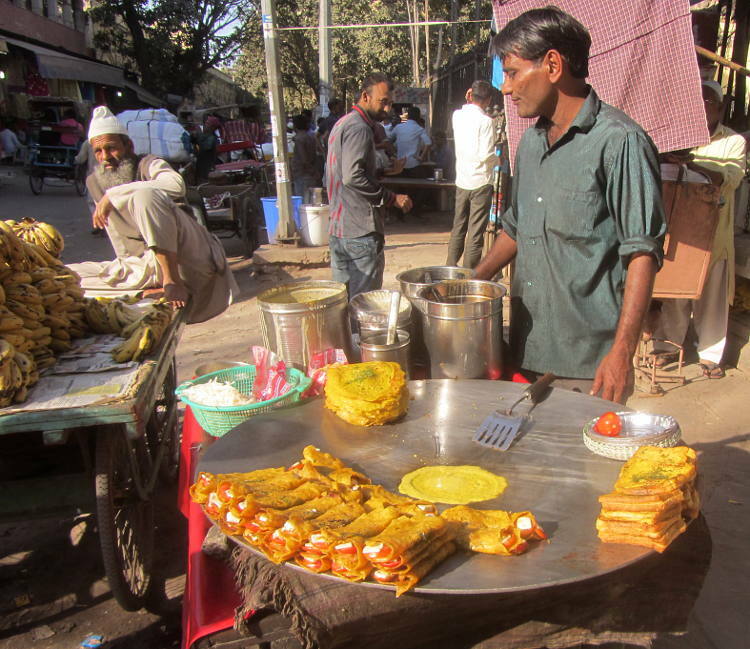 Also lots of hand carts about with interesting little snacks to taste. 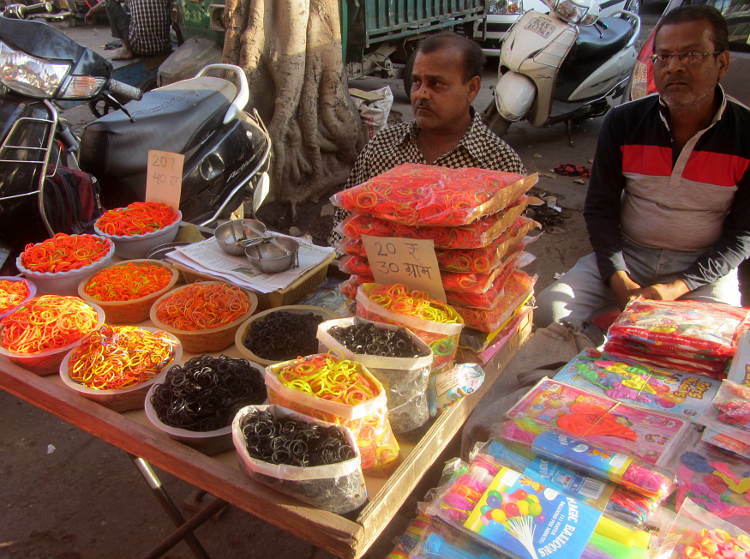 I also saw another rubber band seller (the first one I saw was in Kolkata, last year). 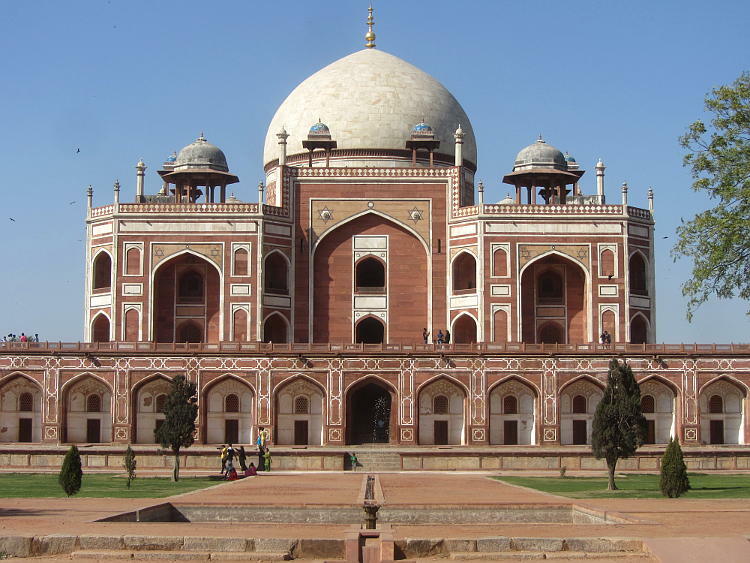 With some spare time on my hand, however, I couldn't resist yet another Mogul monument and probably the best in Delhi - The mausoleum of Humayun. It had recently been renovated and there was an interesting little museum about its history and renovations but they were also in the process of building a huge interpretation centre. Anyway, it was very pleasant, if a little foreigner pricey at 500Rs. But you get a few tombs for the price of one. 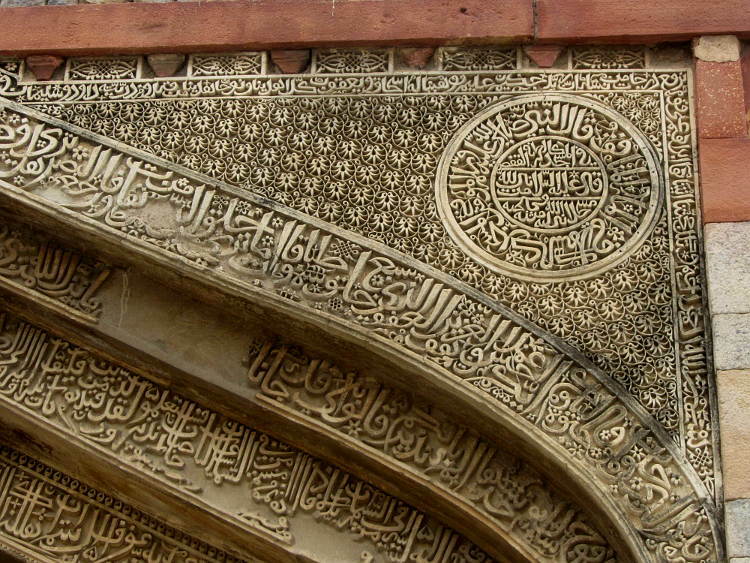 The first as you go in is that of Isa Khan which is very impressive on its own. 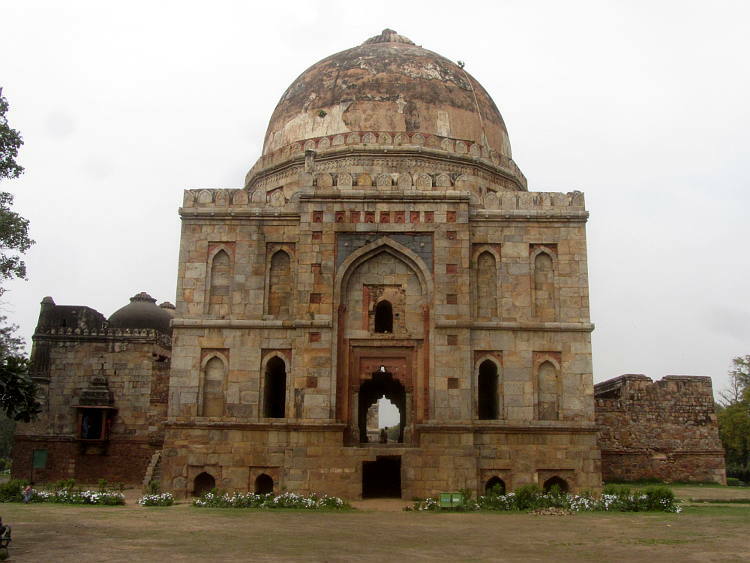 It was built before the Moguls and is an example of Lodi architecture which I was to see later. I was admiring the monument when a couple of youths approached me to see if I wanted to smoke some dope with them. I have to say I didn't need any artificial substances to enjoy this calm and serene spot. 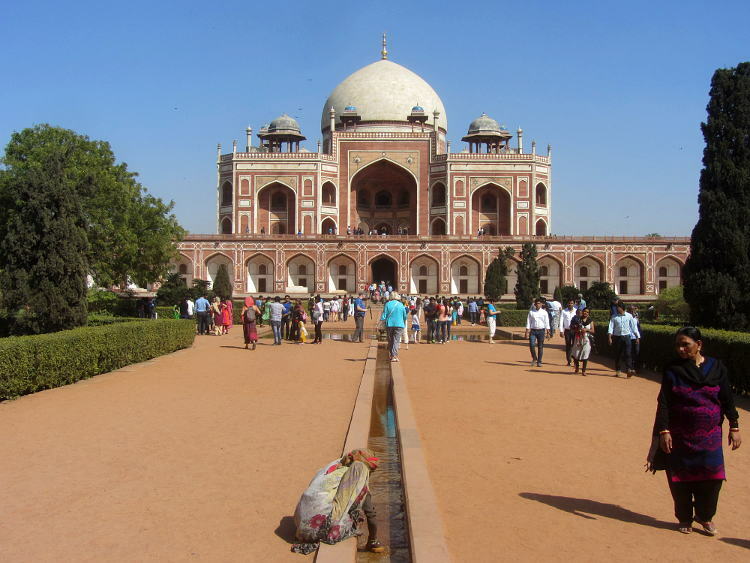 Back in the main gardens I had time to enjoy the highlight, Humayun's tomb and it is magnificent. 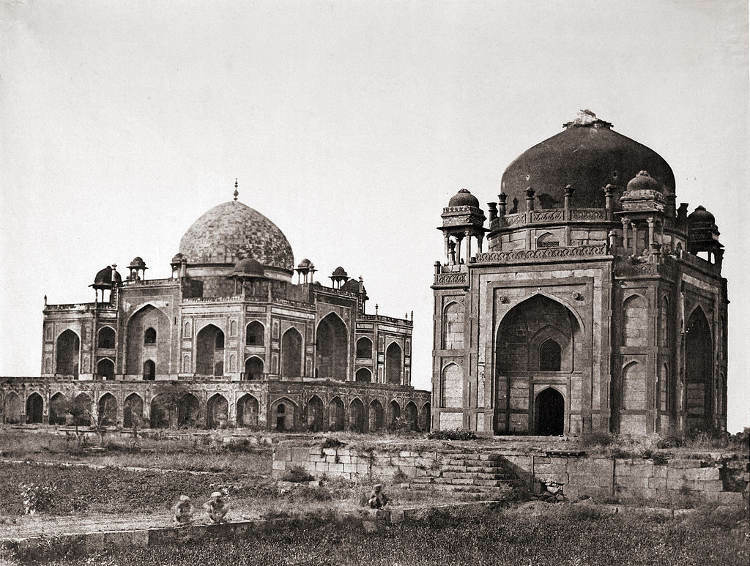 Built in 1569 it is one of the oldest Mogul grand buildings in India, the first to use red sandstone in large quantities and it set a precedent for subsequent Mogul architecture such as Akbar's tomb and the Taj Mahal in Agra. 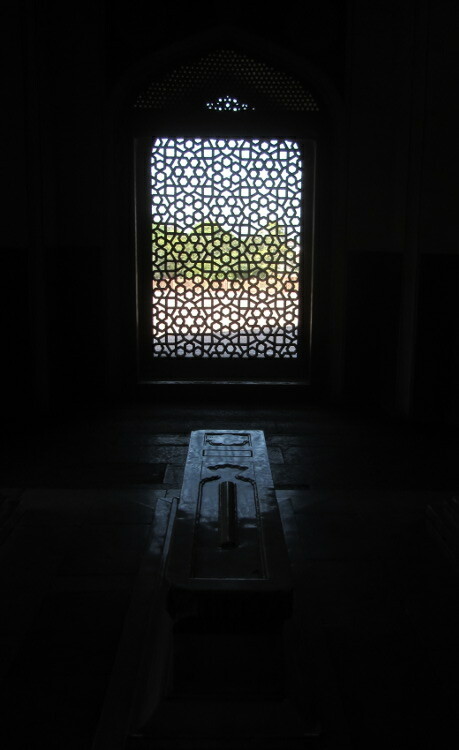 Notwithstanding the magnificent building itself, of course the gardens are a delight to wander with many shady spots and a couple of other tombs including one, apparently made for Humayun's barber. 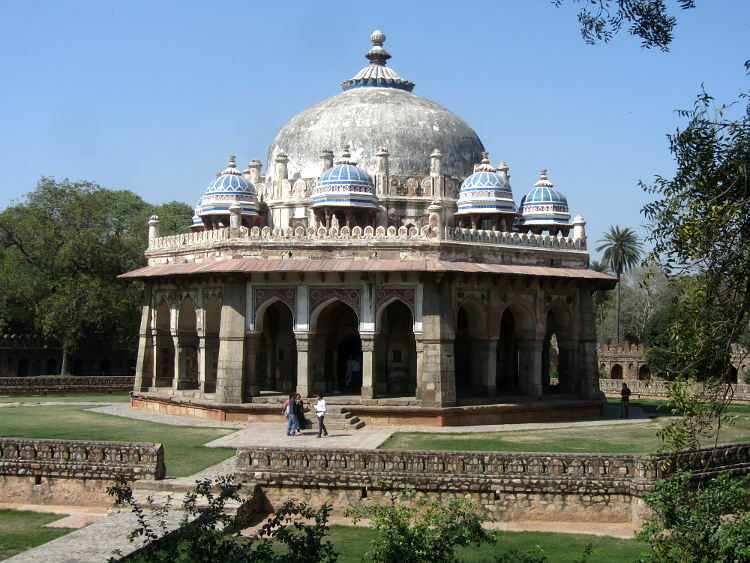 The reason why Humayun and many others are buried around here is because of the proximity to the tomb of Nizamuddin Auliya a very famous 13th century sufi saint. Getting your tomb as close as possible to his gives you extra bonus points when you get to heaven apparently. 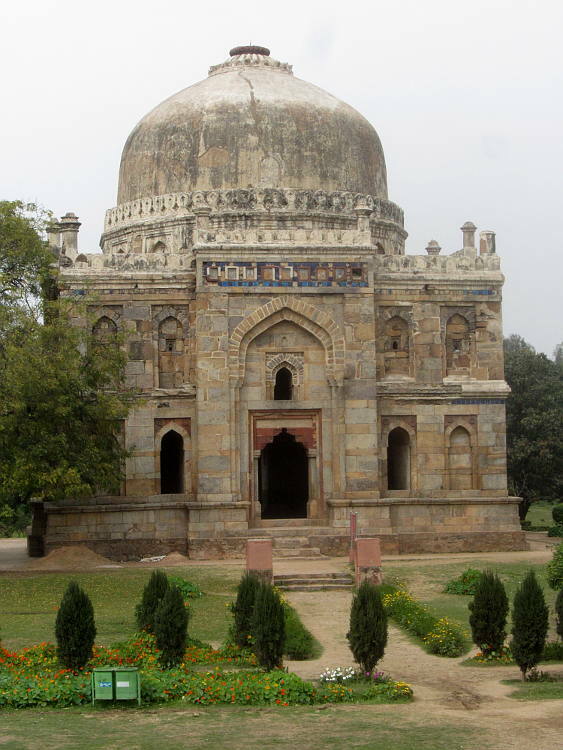 So I went across the road to Nizamuddin's tomb. 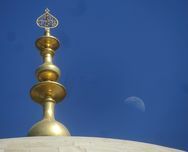 It wasn't easy, as the area is now a maze of alleys with many Muslim pilgrims pushing and shoving all over the place. 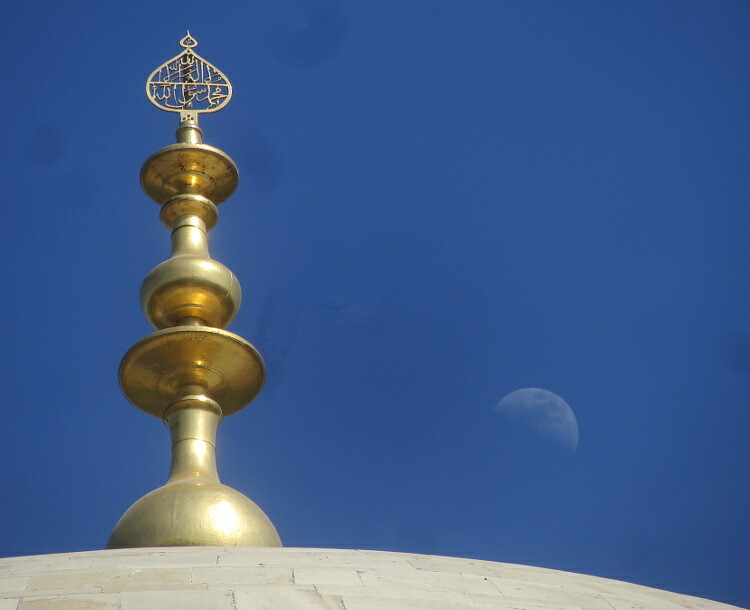 So I didn't actually get to see the tomb as it was so crowded but I was amazed to see so many obviously Muslim people in one place and no security whatsoever. 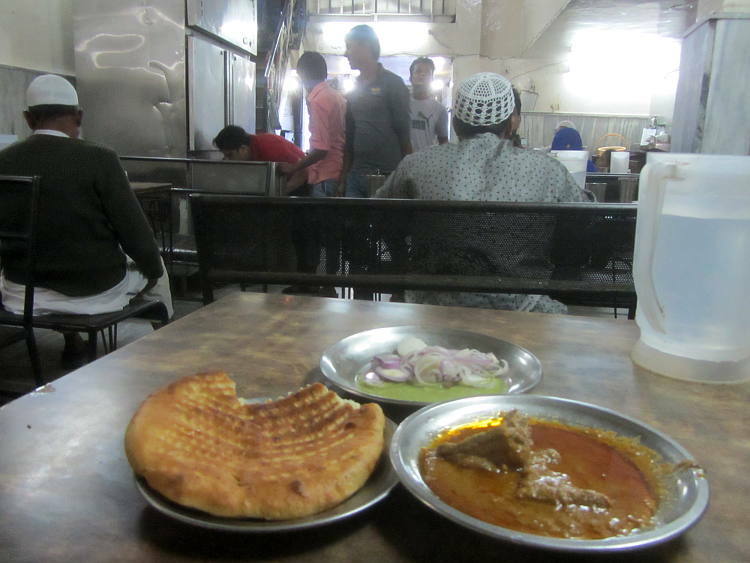 I did have time to stop for a meal though - a very tasty mutton curry and nan bread. I did slightly regret ordering it as I was unsure of its effects on my system, having only eaten veggie food for so long, but it passed the test. Delicious with no adverse affects. 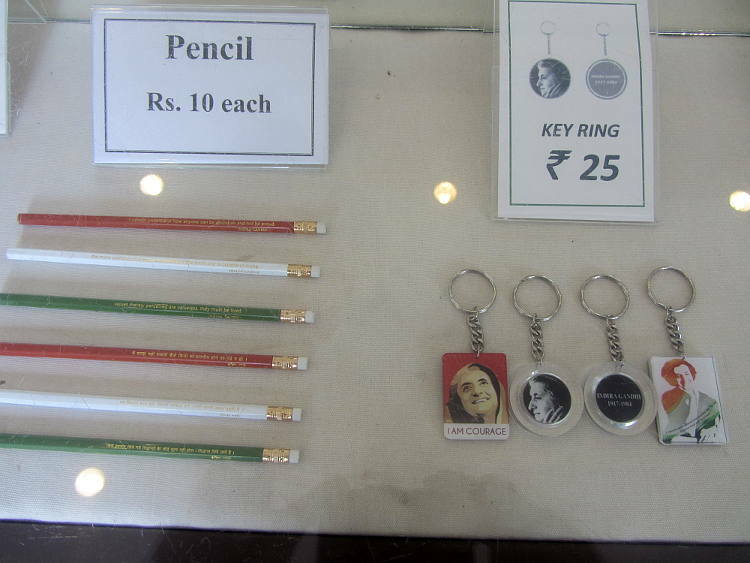 For my last day in Delhi I concentrated on modern history at the museums of Nehru, Mahatma Gandhi and Indira Gandhi. All were really interesting. And free (I don't mind paying westerner fees for monuments but I also do like a freebie. Did I mention that before?). Probably Indira Gandhi's being the best. 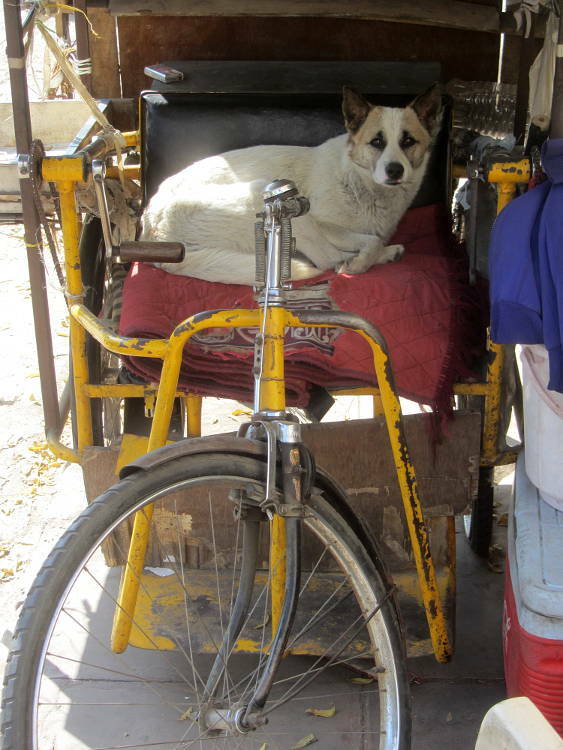 They are all quite close to one another in an affluent area of New Delhi so I got around by tuk-tuk. 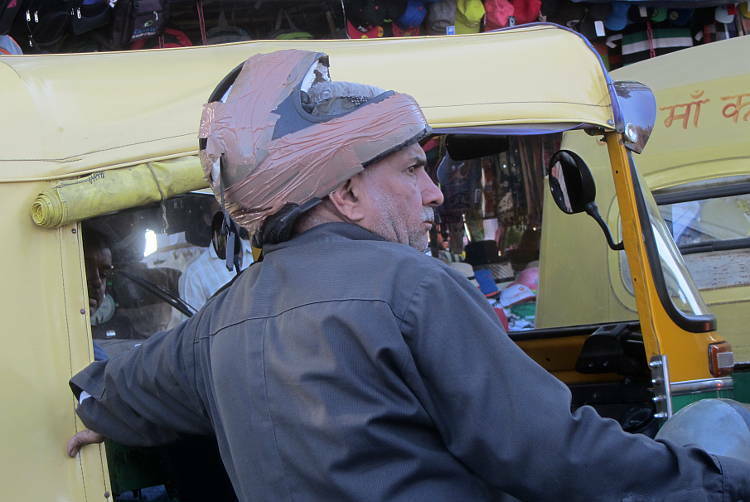 One of the more interesting sights in the traffic was a guy on a motorbike almost wearing a helmet which was repaired with sticky tape. It reminded me of the time I lived in Cairo. A new law had been passed, enforcing the wearing of seatbelts. Quite right you may think. So all the taxis I got into had seat belts. The only problem was they didn't work, you just had to drape the belt over you to give the appearance of a seatbelt in case you were stopped by police. First up was the Mahatma Gandhi museum (also known as the Gandhi Smriti). 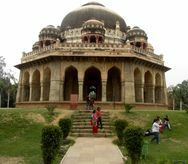 This was the placed Gandhi lived while he was in Delhi and where he was killed. It is in an affluent suburb of Delhi so I wondered whose house it was but no information was given. 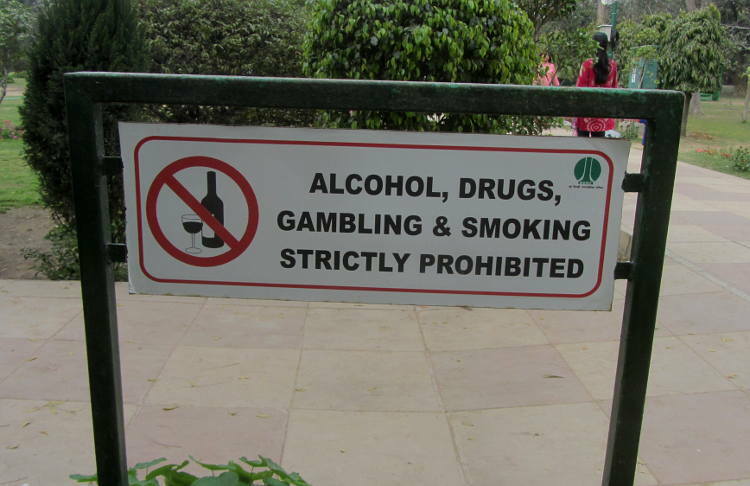 I was later to find out it was owned by the wealthy Birla family. It's an impressive little museum. 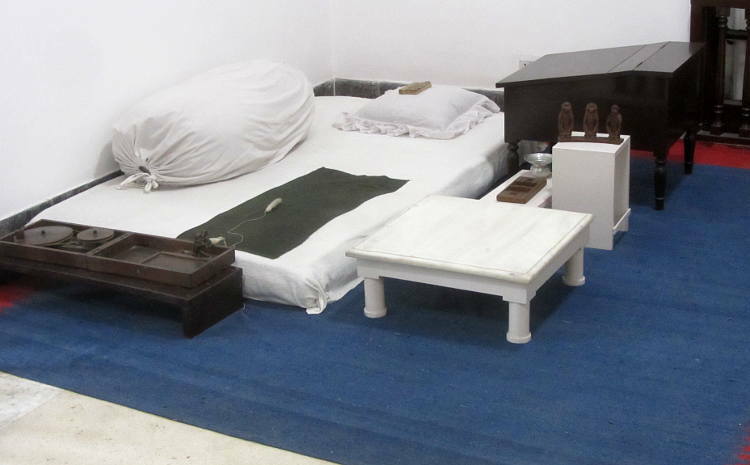 You get to see Gandhi's room as it was when he died, with all his worldly belongings (not many). He obviously liked the little statue of the hear no evil, see no evil, speak no evil monkeys. 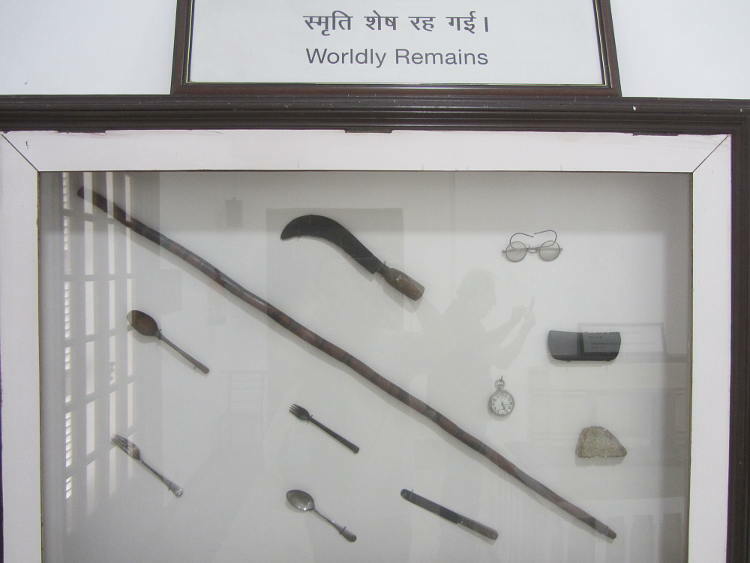 In addition, there is another room with a series of dioramas of important moments in Gandhi's life. They have also recently introduced a series of interactive exhibits. Obviously they knew I was not the brightest light on the Christmas tree so I was followed by a guardian who knew the secret moves to get the interactive displays to work. The garden is very tranquil and Gandhi's last steps are recreated in cement leading to the martyr's column where he was killed. Just round the corner was the former house of Indira Gandhi and now the Indira Gandhi museum. Security was much tighter here. Probably because she is still quite a controversial figure here. In fact there was no security at Mahatma's but here I was frisked and no food or drink was allowed in. 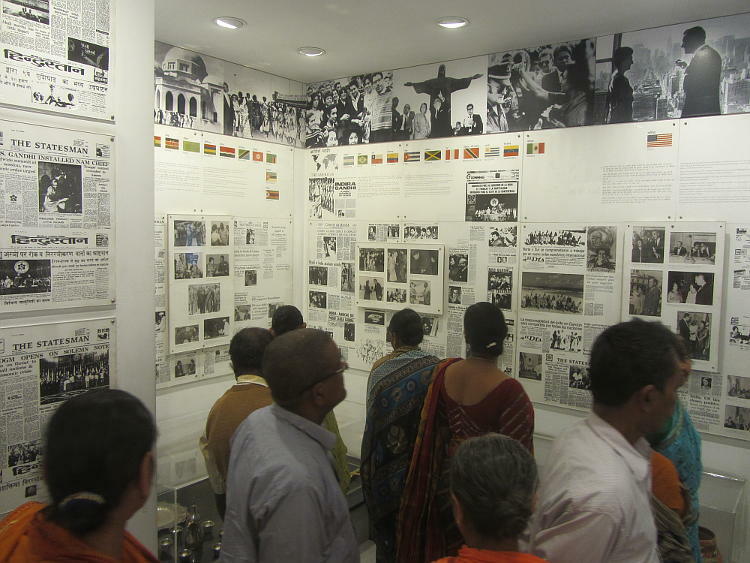 Here you walked through a series of rooms mainly displaying front pages from newspapers of the days describing events during Indira's life. 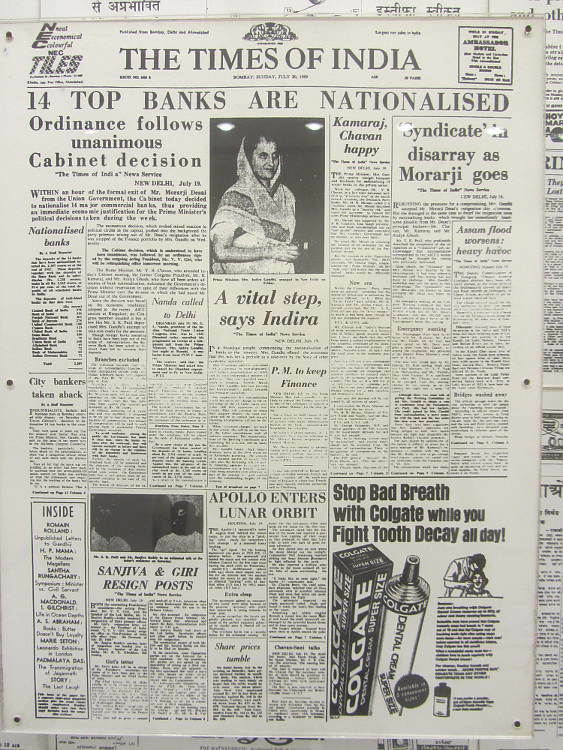 She was nationalising the banks in one display but in a corner of the front page is a reference to Apollo 11 that caught my eye. It described how Apollo had been put into a parking orbit ready for tomorrow's first attempt at a manned lunar landing. There are also some rather grisly exhibits including the blood stained sari she was wearing when she was shot and the remnants of Rajiv Gandhi's clothes after he was killed by a suicide bomb. 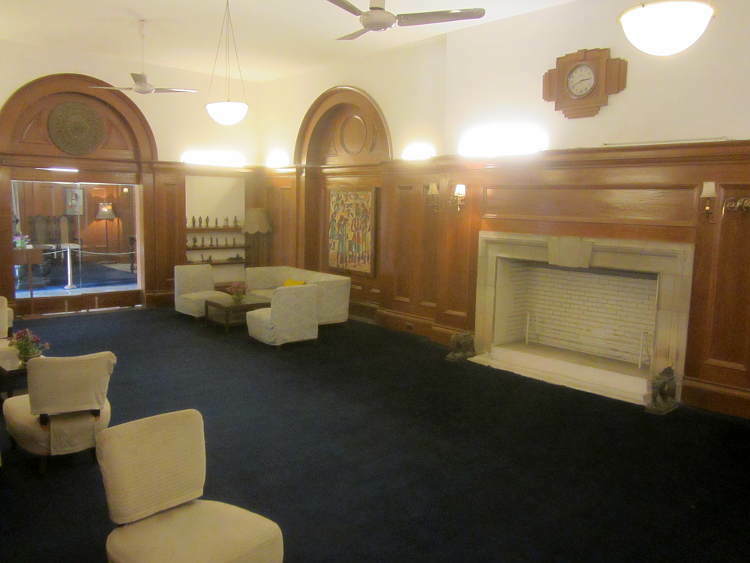 They have also kept a few of her rooms intact from her time and I have to say it looked a very nice house to live in. Not ostentatious but very comfortable. 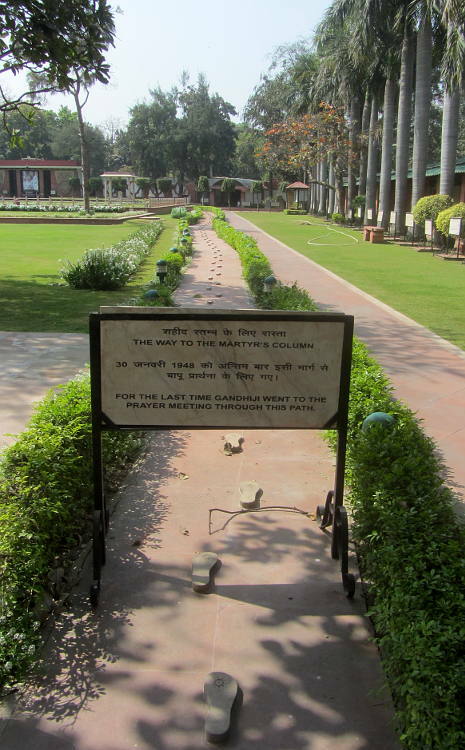 Like at Gandhi's, the place where she was killed is marked along with an enclosed crystal pathway showing her final steps. 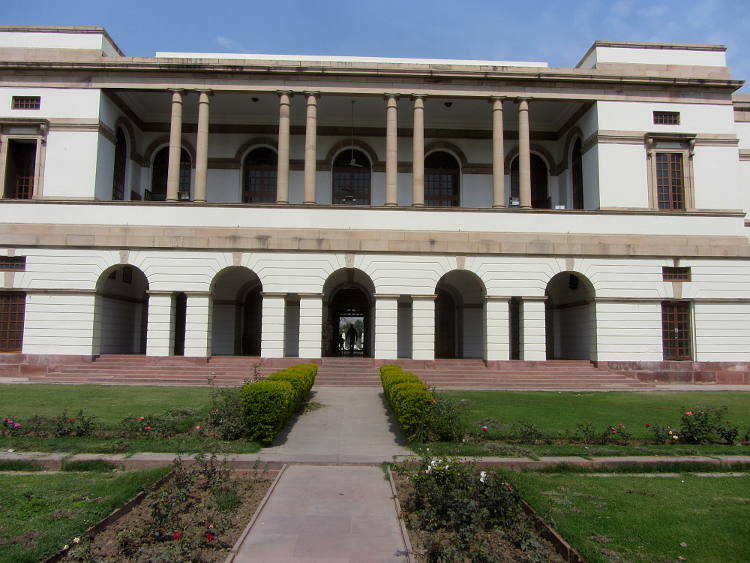 The Nehru Memorial Museum and Library is a much grander affair. Built in 1930 as part of the new imperial capital of India at New Delhi, it was the residence of the Commander-in-Chief of the British Army. 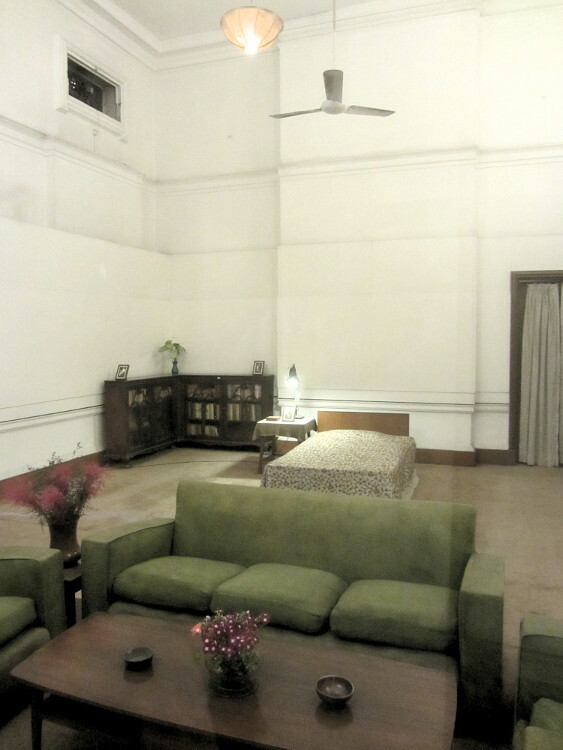 After Independence, the house was taken over by Jawaharlal Nehru (1889–1964). On his death it was converted into the museum. 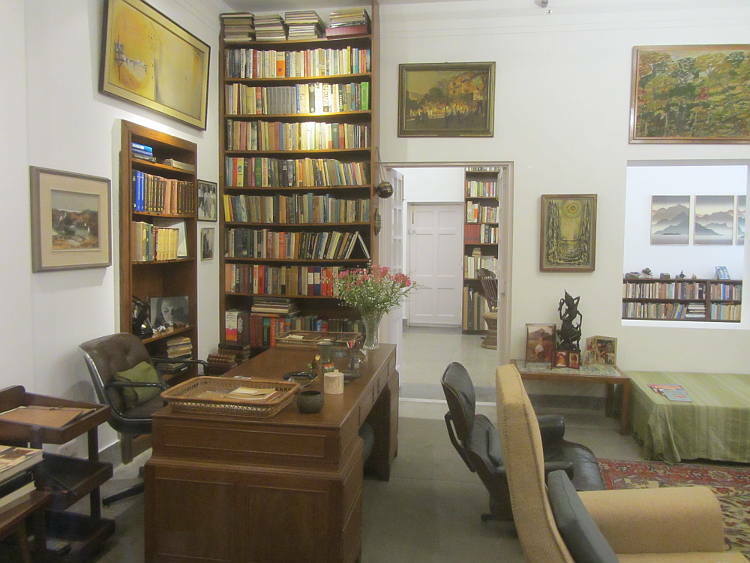 Although a grand building, some of the rooms used by Nehru are on display and look quite down to earth including his study, bedroom and a lounge. 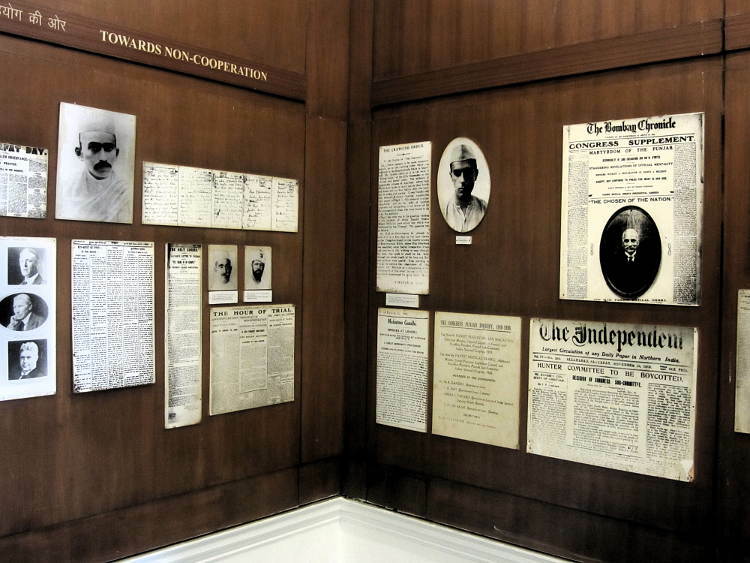 Other parts of the building show important events in India at the time, usually through newspaper cuttings and there is a curious room where you can photograph yourself with Nehru addressing parliament. I can highly recommend all three. Very informative and interesting. And did I say free? 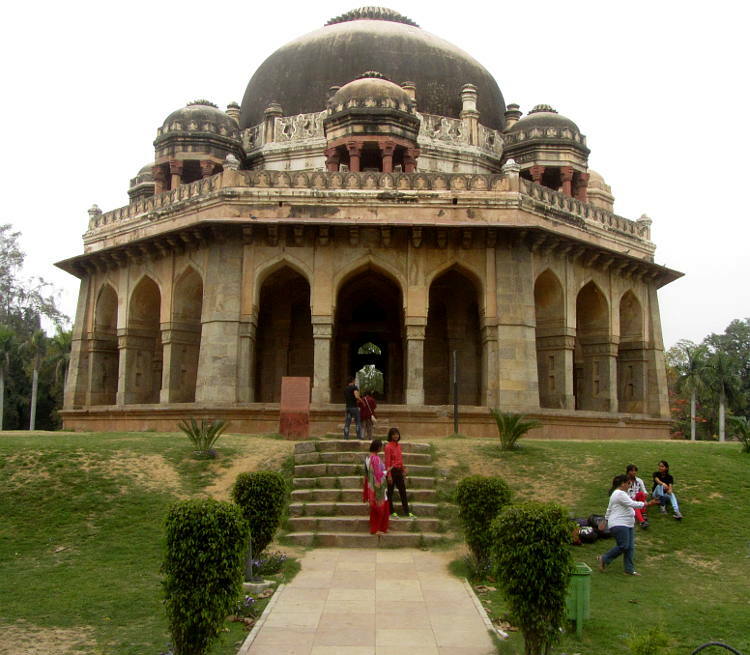 Before I left Delhi I couldn't avoid just one last taster of Mogul architecture so I popped into the Lodhi gardens. A large parkland area where families and couples stroll around, perhaps play a bit of cricket and generally just enjoy a bit of green space. 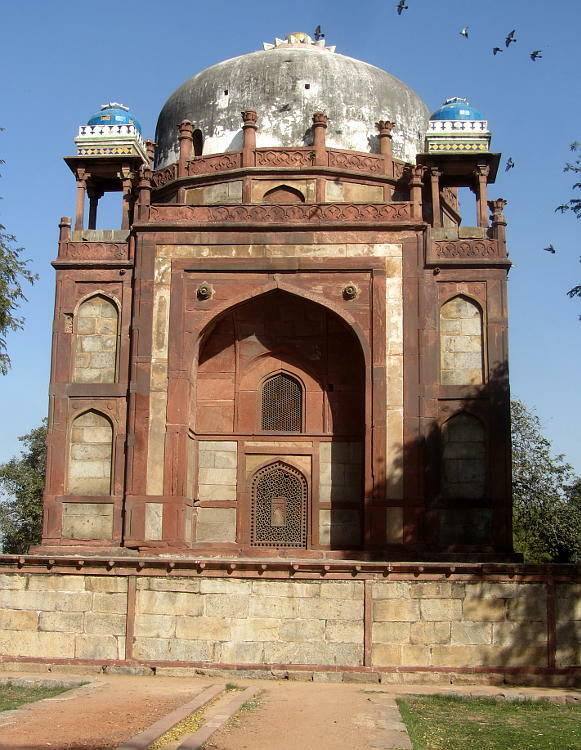 Oh, and it also just happens to contain the mausoleums of the Lodi sultans who ruled Delhi and large parts of India in the 15th century. And then my journey was at an end. 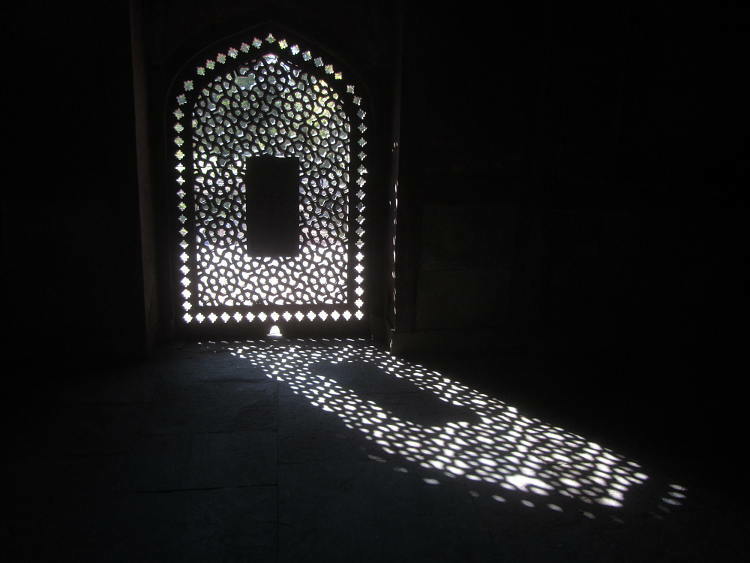 A month in India. Fabulous. Just enough time to take one last photo in the Delhi metro on the way to the airport.